This cute plant has everything I am looking for in a groundcover. 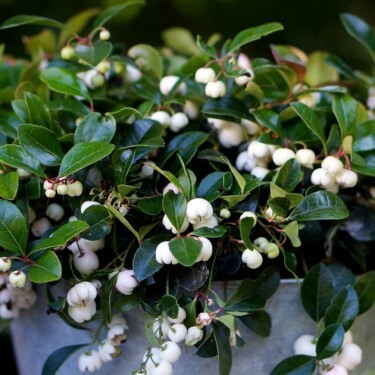 Little bell-shaped flowers in early summer, dark shiny green leaves that are evergreen and as the ‘icing on the cake’ it produces adorable white edible pearl-like berries. I can’t wait to plant this white baby in my garden. This award winning perennial is an attractive evergreen that produces delicate, bell-shaped white flowers in summer and large white, edible berries in the fall! 'Peppermint Pearl' does best planted in a shady acidic or woodland soil, 12" apart. Because of its compact growth it makes a delightful groundcover or the perfect container plant.